Essence ™ Series windows and doors embody beauty and strength. Inside, Essence window are natural, solid wood. Outside, they have a strong fiberglass exterior that won’t rot or warp like ordinary wood-only windows. This exceptional durability is why Milgard can offer something you simply won’t find with other wood windows: a Full Lifetime Warranty with Glass Breakage Coverage. Our proprietary powder-coat process provides an extremely durable exterior coating that resists scratches and gouges. Choose from 15 exterior fiberglass colors. Create elegant interiors with your choice of three wood options. Seal or stain our natural pine or fir to complement the wood finishes in your home. Or go with primed wood and paint the color of your choice. Milgard WoodClad™ fiberglass windows satisfy both the architectural purist and the realist. You get a carefree fiberglass exterior, plus the beauty of a wood interior. And we do mean beauty. 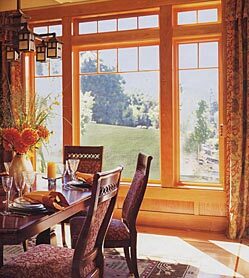 Our windows feature furniture-grade, clear, vertical-grain Douglas fir. Without a nail hole or staple on them. What’s more, since we use solid stainless steel screws throughout, there’s nothing to corrode or rust. Ever. You can stain our wood interiors clear or finish them to match existing woodwork in everything from a maple to a cherry appearance. For the exterior, you can order Milgard WoodClad windows in five baked-on standard exterior colors. A wide selection of hardware and grid options is available.